The mayor of Seville Juan Espadas, the delegate of Security and Mobility Juan Carlos Cabrera, and the manager of Tussam Rubén García presented 30 new CNG buses purchased by the municipal transport company Tussam after an investment of 10.5 millions of euros. These new vehicles are part of the strategy of renewing the fleet and investments to improve service. “When this mandate started we found a company with paralyzed investments and an aging fleet with problems. 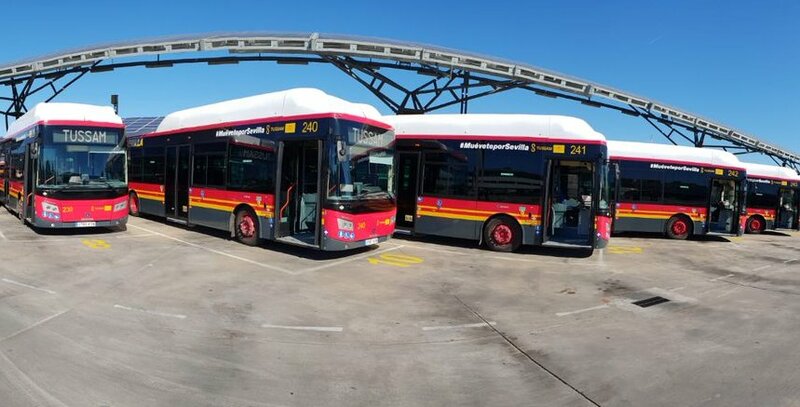 We implemented an investment plan that has amounted to more than 40 million euros (almost ten times more than in the previous mandate) and we have managed to acquire more than 130 buses and reduce the average age of the fleet of 10 years to 8.5,” explained Espadas, who underlined the impact that this line of work is having on sustainability: almost 60% of the fleet already uses natural gas. “We are increasingly closer to the goal of reaching 75% of a CNG fleet and at the same time achieving savings in fuel costs of over 30%,” added Seville mayor. In fact, the forecast is that in 2019 another 30 vehicles can be acquired with an investment of another 10 million euros. The Iberian Peninsula currently offers one of the fastest growing markets in terms of the adoption of natural gas in road transport. In this extremely encouraging scenario, AltFuels Iberia 2019 will take place on 11-14 June at IFEMA Trade Center, Madrid. It will be an event consisting of first level conferences and exhibition of vehicles of all kinds, refueling stations, components, plants, road and marine engines, as well as the entire universe of the alternative fuels industry with the latest technological developments, multiple options for networking, business and new advances. For more information, please contact info@altfuelsiberia.com.